In times like these it is nice to read stories about solidarity. Solidarity is a big word. On the one hand it can be a philosophical subject, on the other hand it can be something tangible, when committed people become involved. It can lead to stories that are extremely touching. Here is one such story, worth writing down. The traditional settlements of Ikaria are known to pretty much everyone among us. Single spaced houses, anti-pirate, as they were named in the later years, made out of stone with no binder, while the roof was covered with an Ikarian stone plate. During the time that the baths at Therma prospered and a lot of people flooded the area around Aghios for its therapeutic baths, an anecdote spread from mouth to mouth. It turns out that the mayor at the time had assigned the Lataria of the area to promote the baths. When my great grandfather was young fell in love with a girl from Fradato. Her father, though, wouldn’t give her blessing, allowing the couple to get married. He wouldn’t approve of his son-on-law, because he didn’t want his daughter to marry someone with less land in his name and grow poorer. Summer again and people are asking me: “Where are you going? 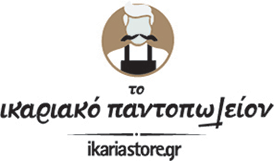 Ikaria again?” They already know my answer – it is: “Yes, of course.” This is all I am willing to say about it. Perhaps they may get an additional smile, but certainly no more explanations or even an invitation to join me. I consider myself an open person, I like to spoil my friends, to share and to invite, but I also like to keep my secrets and my treasures. We have been at the island since the beginning of June. My mom, my siblings and me. My dad didn’t have many vacation days and would be a while until he arrived. I don’t know why, but during that summer I was looking extremely forward to seeing him. Maybe, all summers were like this, and I kept this in memory because things didn’t go exactly as I was hoping for. There is a place up there in the mountains where I have this wonderful view to the sea, to Samos and on good days even to the Turkish coast. Sitting there is pure meditation. When I close my eyes I can feel the vibrations of historic events unfolding here. Truth is, and I want to get it out of my chest, even if it might be considered unbecoming of the average permanent Ikarian citizen, that quite often I get seized over by stress. August is coming to an end. The wind is getting stronger, blowing leaves, dust, napkins and empty plastic cups over the platia. People working in the cafés are tired, their good morning greetings are not as loud as in the previous weeks. For one there is the archaeology of tangible civilization. But there is also another kind: the one that locates the intangible treasures, the elaborate human achievements that made it through the centuries, for us to rediscover them today – all it takes is to look beyond the mere objects.